I bought these for myself knowing the good results the previously tested had. 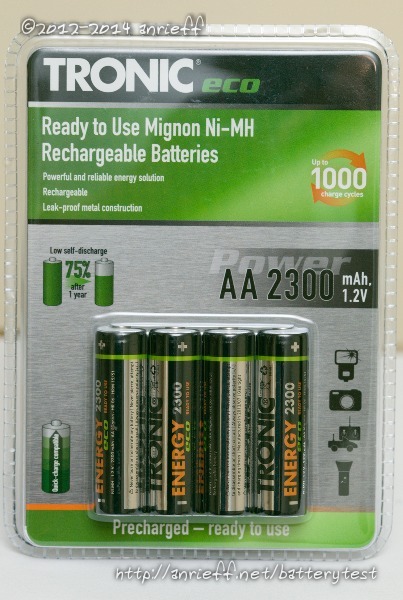 There are a few differences now: the price is half an euro less, the packaging has them at 2300 instead of 2100 mAh, and the results are noticeably better, clocking around 350 mAh more on average. A year later I tested yet another pack, which, this time, was virtually identical visually and electrically. Some details: the cells were around 4 month old when I tested them. The factory charge was reading at 5.08V, with a good balance between the cells, and held ~1680 mAh. This was followed by a normal forming, in which the cells showed a fair balance, around 70 mAh difference (we've seen better). 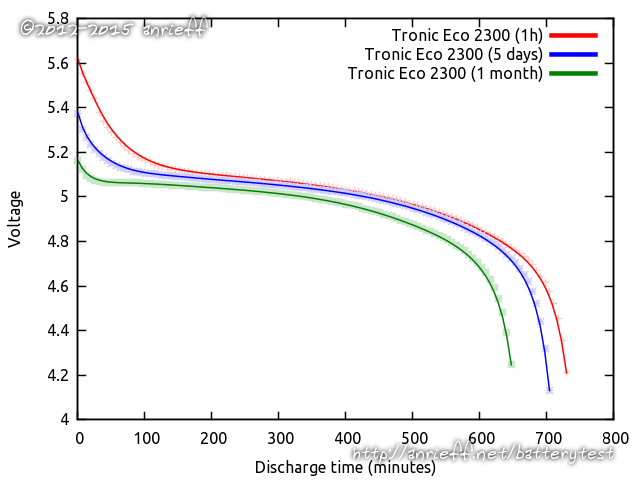 Later the cells had two discharges at 1-hour wait (2120, 2100 mAh) as well as one 5-day (1980). A month later, the cells' voltage was 5.21 (dropping to 5.20 after heating) and held just a bit more than 1840 mAh, which means 12% self-discharge per month, which surprisingly high for a LSD-labelled AAs.